PRO Wholesale can supply a huge range of Rotating Electrical components to suit anything from a small engine vehicle through to the largest of mining dump trucks. 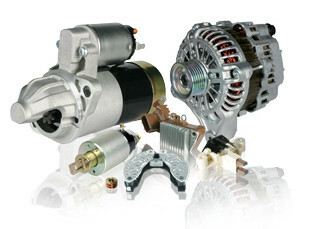 OEX, Bosch, Denso, Leece-Neville, Prestolite, Mitsubishi Electric, Valeo and Delco-Remy. Alfa Romeo, Audi, Bmw, Chrysler, Citroen, Daewoo, Daihatsu, Fiat, Ford, FPV, Holden, HSV, Honda, Hyundai, Isuzu, Jeep, Kia, Land Rover, Rover, Lexus, Mazda, Mercedes-Benz, Mini, Mitsubishi, Nissan, Opel, Peugeot, Proton, Renault, Saab, Skoda, Subaru, Suzuki, Tata, Toyota, Volkswagen, Volvo. Caterpiller, Freightliner, Hino, international, Isuzu, Iveco, John Deere, Kenworth, Komatsu, Kubota, Mack, Mitsubishi Fuso, New Holland, Nissan UD, Scania, Thermo King, Toyota, Volvo, Western Star, Yanmar. As the range is so large it's impossible to list all of what's available but please fill out the form below with your needs and we'll reply with Prices and Availability.